Scoring 2,091 points for the Gators over four years, Sessoms was a three-time team MVP, two-time All-State selection, and nominee for the McDonald’s All American Game. Talent aside, his tough-as-nails attitude, confidence on the court, and natural ability to lead was the perfect recipe for any college basketball program. A Changemaker in his own right. 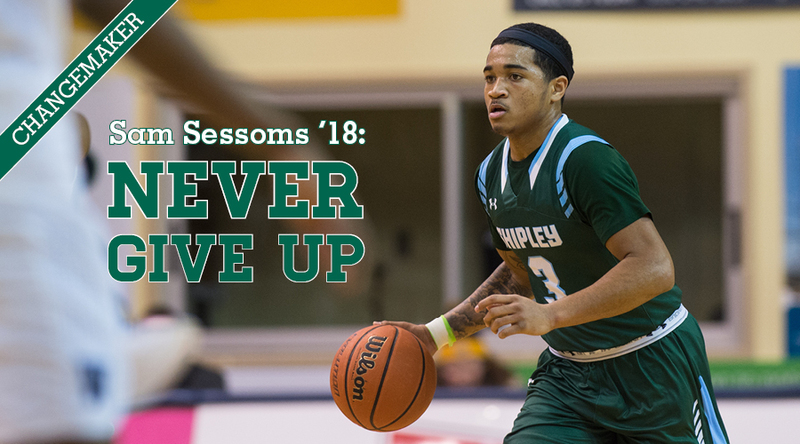 But in the summer of 2017, as Division I offers came pouring in for his courtside peers, Sessoms was in communication with several college programs, but no offers came to the table. Rather than letting it get to him, Sessoms stayed confident in his game, kept working hard, and most importantly, exercised patience. When Division I Binghamton University knocked on the door, Sessoms accepted and was on his way to becoming a Bearcat. Well into his freshman season at Binghamton, Sessoms is putting up big numbers. He’s earned five America East Rookie of the Week honors, set school records for three-point scoring, and ranks seventh in the country for freshman scoring and 38th for made field goals. We sat down with Sam to learn more about his college basketball career, and the role Shipley has played in shaping him into the athlete and student he is today. Shipley: Has playing college basketball always been a dream of yours? How did your time at Shipley help nurture this dream? SS: Since I was a little kid, playing basketball was always a dream of mine. My time at Shipley helped me to achieve this dream in more ways than one. The team I was a part of at Shipley and the coaches helped to put me in positions to succeed and pushed me every day to be the best player and teammate I could be. My time as a Shipley student has definitely made a large impact on my life. Shipley: How has your time at Shipley impacted you personally and/or professionally? SS: Shipley helped me to mature a lot faster than most high school students. Even as a freshman, I was put in positions to lead my peers and take charge. Every day I was learning and developing new ways to perfect my craft or lead a different group of people. This ultimately made me a better person because I was able to connect with so many people from different walks of life with my leadership skills. Shipley: What do you aspire to do after college? SS: After college, I hope to continue my basketball career and play at the professional level. It would be my hope to have a long and successful career, which then leads me into a coaching position at a college or professional level after I retire from playing. Shipley: What has been the biggest challenge you faced and how did you overcome it? SS: The biggest challenged I have faced so far was the transition from leading a group of 14-18-year-olds, to leading grown men in their twenties. The transition from high school to college basketball is tough, especially when you assume a leadership role, as a freshman. I am still trying to overcome this challenge day by day and am doing so by communicating more than needed and asking questions. Shipley: What advice do you have for students who hope to follow in your footsteps? SS: Every kid is different, everyone’s path is different, so just be yourself and work hard. The hard work will pay off and it will show in the results. Even if you fail a few times, keep trying. Never give up.